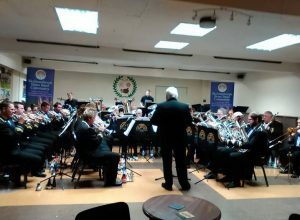 It was a cold and rainy Sunday evening when The Skelmanthorpe Band, for its first Christmas concert of the season, travelled to Greenfield’s Boarshurst Band Club in Saddleworth. Compered and conducted by its MD, Jim Davies and along with a superb choice of Christmas tunes, the band celebrated music of stage and screen including a spooky rendition of John Williams’ The Devil’s Dance from the supernatural 1987 movie The Witches Of Eastwick and Howard Ashman’s Genie’s theme Friend Like Me from Disney’s 1992 animated feature film Aladdin. Continuing the Disney motif, Eb Bass soloist, Gregor Spence played a superb interpretation of Terry Gilkynson’s The Bare Necessities from the 1967 animation The Jungle book. And without a habit or wimple in sight, the band also played Frank Pourcel and Paul Mauriat’s I Will Follow Him (arranged for brass by Frank Bernaerts) which features at the end of the 1992 film Sister Act. What an excellent evening of music-making and a fantastic start to the Christmas period!